Yes, I'm still here.....thank you to the many followers who emailed me. Things have been a bit crazy in our household but all will be well. Our hearts go out to all those suffering the aftermath of the hurricanes. Realizing what those folks are facing, certainly puts one's little bumps in the road in perspective. Okay....let's talk fabric! The purple discharge motifs I blogged about recently are still on my design wall and I'm NO closer to a design solution. So, in the meantime, another one of my rust-dyed vintage linens got my attention. The embroidery design was kept quite simple to avoid over-powering the lovely lacey motifs. It was mounted on mottled hand-dyed silk noil. 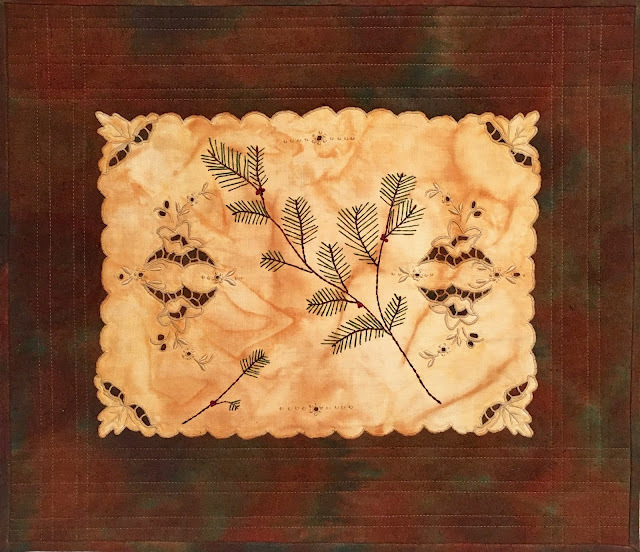 PINE BOUGH 18" X 15.5"
Vintage linen, hand embroidered/dyed with iron water, hand-dyed silk noil. Glad you are okay. The pine embroidery is just perfect for that piece. I love this pieces!!! This is a wow piece for sure! Hope you're doing well now! It's good to know one is missed!! No worries....just some bumps in the road! These are so appealing . . .
Good to see you back. 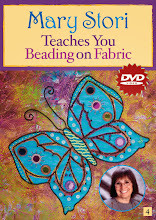 I'm sure stitching therapy helps thru those bumps in the road of life. I love this piece. We tend to (at least I do) overthink things but the simple approach is usually the best. This simple pine stitching is perfect for this piece.